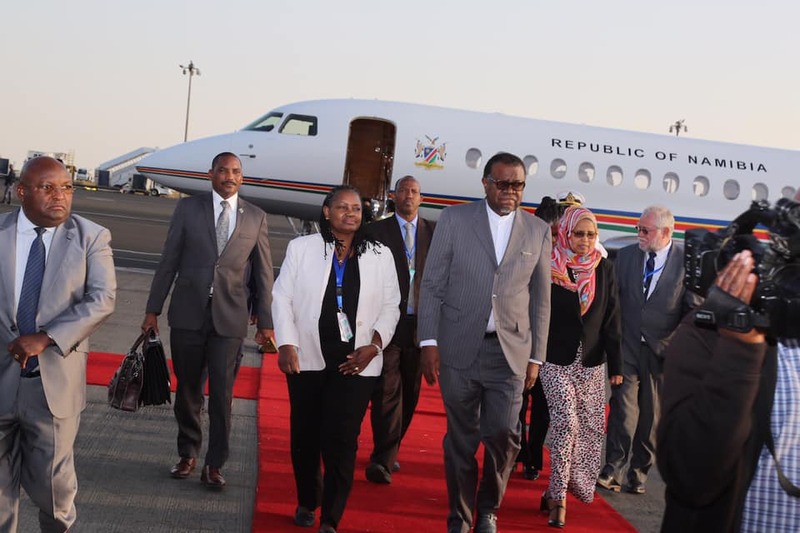 Pictured: The President of Namibia arrives in Addis Ababa to attend the 32nd Ordinary Summit of the African Union. Photos: Courtesy of the Namibian Presidency. 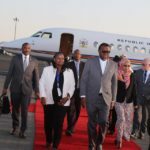 The President of Namibia, Dr. Hage Geingob arrived in Addis Ababa for the 32nd Ordinary Summit of the African Union during which he will also meet with the Secretary-General of the United Nations, Antonio Gutérez, to discuss developments in the Southern African Development Community pertaining to peace, development and security. Dr. Geingob also held a bilateral meeting with the newly elected President of the Democratic Republic of Congo ahead of the SADC Head of State and Government Consultation. During the special meeting of the SADC heads of state on the sidelines of the AU Summit, Dr. Geingob requested the newly elected president of the Democratic Republic of the Congo, President Felix Tshisekedi and President Emmerson Mnangagwa of Zimbabwe to brief him on recent developments in their respective countries. The 32nd Ordinary Summit of the African Unions will convene under the theme “Refugees, Returnees and Internally Displaced Persons in Africa: Towards Durable Solutions to Forced Displacement in Africa”. Time permitting, President Geingob will also participate in key meetings to which Namibia is a member, including the Committee of Ten Heads of State and Government Champions for Science and Technology, the Committee of Ten on the Reform of the United Nations Security Council, the African Peer Review Forum of Heads of State and Government, and as board member of the Africa Renewable Energy Initiative. On 11 February, President Geingob will participate in a Breakfast Meeting on the 400th anniversary of the Atlantic Slave Trade, to be hosted by the President of the Republic of Kenya, Uhuru Kenyatta. President Geingob will also hold several bilateral meetings with visiting Heads of State and Government, including the President of Estonia, Kersti Kaljulaid with the objective deepening collaboration with the Government of Estonia on e-governance and digital transformation in Africa.